The most-liked U.S. Presidential candidate Ben Carson believes that it’s okay to be born poor, but that anyone who stays poor is remaining poor because he or she is lazy. He also says that those poor people are trying to find excuses for their own laziness when they blame their adversities on other causes than themselves, such as the prejudices of others, or wrong governmental policies, or bad luck; and he is especially opposed to governmental policies that aim to provide special advantages to poor people: he believes that this liberalism only encourages the laziness of those people. He was born dirt-poor and now draws tens of millions of dollars in annual income; and he thinks that the reason he’s successful is that he’s terrific — and he wants all Americans to try to be terrific like he feels that he is; so, he’s on a campaign to make it happen by his becoming America’s President. And he’s turning out to be remarkably successful at this campaign, too. Among the entire U.S. electorate including both political parties and also independents, candidate Ben Carson’s “Net favorable” rating is +21%. The second-most-popular candidate is Carly Fiorina, at +6%. 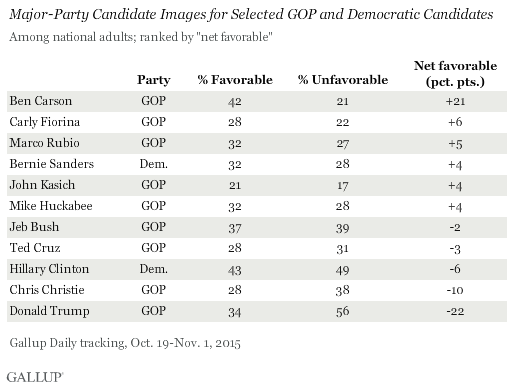 The third-most-popular is Marco Rubio, at +5%. The fourth-most-popular, and the only Democrat whose net-favorable rating is positive rather than negative — i.e., who is more popular than he’s unpopular — is Bernie Sanders, at +4%. Based on the crucial predictive factor of net-favorability (or more-commonly refered to as “popularity”), the 2016 general-election campaign will thus likely be between Ben Carson and Bernie Sanders. That will probably be the ultimate contest. This is the latest poll, issued on November 5th by Gallup; which says, “Results for this Gallup poll are based on telephone interviews conducted Oct. 19-Nov. 1, 2015, on the Gallup U.S. Daily survey, with a random sample of 7,121 adults, aged 18 and older, living in all 50 U.S. states and the District of Columbia.” So: this is more than just the typical national survey, which samples only 1,000 respondents. The overwhelmingly most-popular candidate, Dr. Carson, says (8:30- here): “I hated poverty; I couldn’t stand it.” He said in that video there (at 18:00) “My role model is Jesus” and he then went into the “moral problem” of “the national debt,” and he continued, “Here’s the [Jesus] parable. A family falls on hard times” and the father in the parable says he’ll cut the allowance for some of his children but not for others. Carson concluded there: “How do you think that will go down? Not too well. Enough said.” In other words, Carson was asserting that governmental policies must not help the poor or disabled or otherwise disadvantaged, any more than they help the rich and successful and otherwise advantaged (including heirs to huge fortunes). Carson’s basic assumption there is that everyone has the same obligation to fund the government: the homeless or disabled who sell something on the street must pay the same percentage “tithe” from that person’s meager income to the government as does a billionaire who flits from one mansion to another and who maybe inherited most of his wealth and all of the opportunities for growing it but whose stock dividends and interest-income pay for all of his or her consumption and then some. 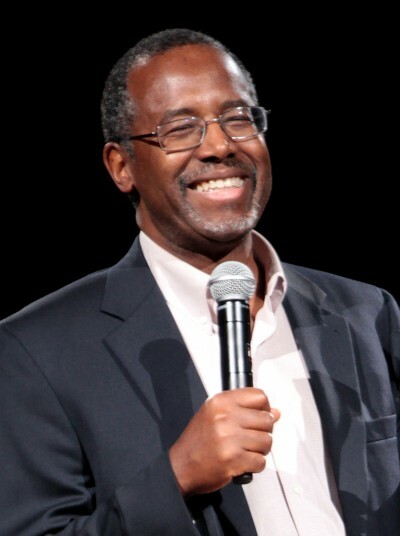 Evangelicals — fundamentalist Christians — have been flocking to Carson’s banner.Their sky-high favorability-ratings of him are a significant reason why he tops the overall list. But it’s not the only reason: many other Americans are not consciously shaped by biblical values, or else they’re shaped by biblical values that contradict the biblical values that conservatives focus on — by liberal biblical values — and many of those voters are also drawn to candidate Carson because they, too, admire a man who takes the Bible seriously, even if the parts of it that have shaped Carson contradict the parts of it that have shaped those liberals. Any religious Scripture (not just the Bible) can be cited to support drastically mutually-contradictory values; no religion provides any internally consistent value-system, other than the essential belief for any religion: that The Almighty defines what is good or bad; that might makes right. The fundamental religious belief alone is sufficient to propel Carson to the top, in America’s popularity-contest. Religion is basically conservative; and Carson is clearly the leading religious candidate, at the present time. Though that fictional ‘Jesus’ ‘spoke’ out of both sides of ‘His’ mouth, both of them were appealing to the same fundamental authoritarian principle behind worship of The Almighty: Might makes right; God alone determines what is good, and what is bad. In this deeper sense, Carson represents even religious people who disagree with him, people who draw their inspiration from liberal passages in their Scriptures. Perhaps this is the basis for his current wave of success — the wave that might carry Carson all the way into the White House. In the final analysis the billionaires who fund the Republican Party might collectively decide that he is their champion too.